President Maithripala Sirisena and Prime Minister Mahinda Rajapaksa have no intention of dissolving Parliament and they will take all the necessary measures to make the country move forward in the correct direction, Agriculture Minister Mahinda Amaraweera said. The Minister was speaking on the current political situation in the country at the national ceremony to plant 500,000 jak saplings islandwide yesterday at the Government Information Department. The Minister said no discussion was held between the President and the Prime Minister with regard to the dissolution of Parliament and they will take all possible measures to direct the country towards prosperity. “The government has already secured the majority of seats in Parliament and the number would be increased further,” he said. The Minister said measures will be taken to hold Provincial Council Elections within the next few months and the government will ensure a peaceful environment for all voters to cast their votes as they wish. Since they are not the followers of European agendas, they will never implement Western-influenced initiatives in the country. Minister Amaraweera charged that the Speaker is totally politically biased and acting beyond his powers. He prepares documents while staying at Temple Trees. If he continues to do so without studying the Constitution of the country, he could even be subjected to a punishable offence. 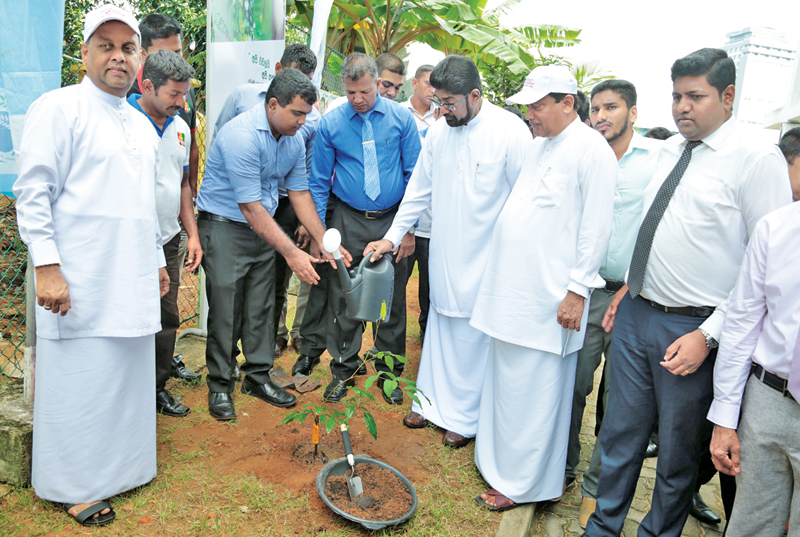 The national ceremony to plant 500,000 jak saplings was held yesterday under the patronage of Agriculture Minister Amaraweera and Mass Media and Digital Infrastructure State Minister Keheliya Rambukwella. This is a part of the national programme to plant one million jak saplings which was implemented by the Agriculture Ministry a few months ago under the massive food production drive of the Ministry, Api Wawalai Api Kanne, to commemorate the 100th anniversary of the jak fruit propagation campaign led by pioneering philanthropist Arthur V. Dias, popularly known as ‘Kos Mama’. Speaking to the media on the occasion, the Agriculture Minister said the Agriculture Ministry has already started a number of programmes with the intention of making Sri Lanka a self-sufficient country. Mass Media and Digital Infrastructure Ministry Secretary Charitha Herath, Western Province Agriculture Minister Gamini Thilakasiri, Director Information Nalaka Kaluwewa and other officials participated in the occasion.